FINAL FANTASY BRAVE EXVIUS APK is available for you in version 2.1.0. 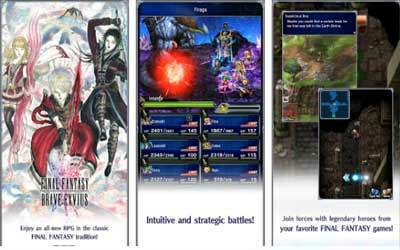 It is spin-off of Final Fantasy series that brought turn-based RPG genre like Brave Frontier. You will follow the adventures of three characters named Rain, Laswell, and Fina in their efforts to restore peace in the Lapis world. If you’ve ever played Brave Frontier before, I think you will be familiar with the game. Just like Brave Frontier, you will develop and manage group of characters to complete variety of quests and missions in the game. Each character has unique characteristics, and you can mix and match them. There is combination of attack and tactics are almost unlimited, so each fight will seem exciting and challenging. Developer involves grinding and offer IAP system like most other similar games. There is summon feature with gacha mechanism that you need to do to get a variety of characters. Each character can be increased its power by increasing the level or evolved. To facilitate you perform grinding, the developer has provided set of automation features battle. You simply set to the Auto mode for fully control by computer, or repeat mode for repeating the action that you have done in the previous battle. Tap the screen to attack, but combine magic abilities with tactical know-how to overpower your opponents in strategic maneuvers. Move characters through fields and dungeons to search for items, hidden paths, and new routes to your destinations. Nostalgic feeling and great story. The story for this game is awesome, and love how you can summon different heroes from every series. Gameplay is nice, you won’t get bored easily many things to do, battle system is nice.